Thrillpowered Thursday: 186. It's not who I thought it was! 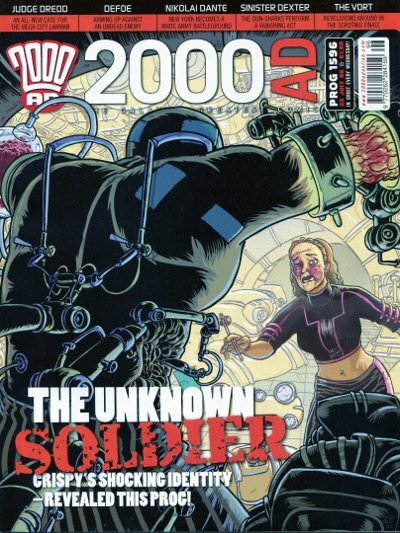 July 2008: In prog 1796, a serial called The Vort wrapped up. This eight-part tale of future war on a strange planet where the laws of physics are challenging the human army had readers' suspicion circuits buzzing from about page two. There's a really strange "man of mystery," badly wounded and disfigured, his facial features obscured by hideous scar tissue, among the cast. He's called Crispy, and the main protagonist, a reporter, is determined to learn his secret. What's more, there's the curious nature of the serial's credits. The artist is the popular and awesome D'Israeli, and the writer is listed as "G. Powell." We'd been down this road twice before. When John Wagner had written The Dead Man in 1990 as "Keef Ripley," that certainly looked like a pseudonym, but this was before any internet-based fandom could get together and speculate about it. The Dead Man established this unusual tradition to hide the identity of the hero: the writer uses a fake name, and the artist, in that case John Ridgway, is one not really known for drawing the character. As for "G. Powell," Tharg swore that this was a brand new droid, but nobody believed him. Speculation wasn't exactly running wild, but I had my theory, and I was pretty sure of it. I figured "Powell" had to be Arthur Wyatt. See, the writer Gordon Rennie had taken a sabbatical from 2000 AD around this time, leaving lots of dangling subplots across three separate series, to take on some better-paying work in the video game industry. It was understood that Cabbalistics Inc would be rested for the time being - a really long time being, as it has turned out - but that The 86ers would be resuming in 2009 with Wyatt as the new writer. This series, a spinoff of Rogue Trooper, had been absent for about a full year at this point. My guess was that "Powell" was putting a subplot together - the return of Rogue himself, badly wounded, amnesiac, and calling himself Crispy - and that we'd get a last-page revelation of Crispy as our blue-skinned, biochip-totin' buddy, setting up his move to the Acoma System to hook up with Rafe in the next 86ers story. This theory made perfect sense. It even worked on the art front, because D'Israeli had never drawn Rogue Trooper before. Of course, he'd never drawn Lobster Random before, either. Aloha! Crispy was Lobster Random and "G. Powell" was Si Spurrier. So there. Elsewhere in the Galaxy's Greatest, Robbie Morrison and Richard Elson start a four-part Judge Dredd story in which criminals use an electromagnetic pulse to shut down a city block, with the unintentional side effect of also shutting down Dredd's bionic eyes. There's more Sinister Dexter, and the Nikolai Dante epic "Amerika" moves toward an unforgettable conclusion. For about the last two years of the series, since prog 1511, Dante has been working as Tsar Vladimir's top agent, neither trusting the other, and with good reason. Dante doesn't know that Vlad's armored "Lord Protector" is really his own half-brother Konstantin, and Vlad doesn't know that Dante's been quietly assembling "an army of thieves and whores" to lead a rebellion. So, Dante has assembled a rough alliance in the streets of New York to repel the beachhead from the alien White Army, and Vlad sees the whole endeavor as, tactically, a big waste of time and resources, and moves his fleet in to just wipe Manhattan, and everybody in it, human and alien alike, off the face of the earth. Dante escapes in the nick of time, but it looks very much like all the people who moved onto the island from the other old boroughs at his urging have all been slaughtered. Our hero completely loses his temper, especially when Vlad and Arkady are all smug and supercilious about their awful abuses of power, and the look on Vlad's face when Dante puts his sword through the old man's stomach is a stunner. Dante's blow is about six inches lower than it needed to be. As our hero goes down in a hail of energy blasts, he knows that he wasted the effort; Vlad is going to survive, and we poor readers will have an agonizing thirteen weeks to see what will happen to him next. 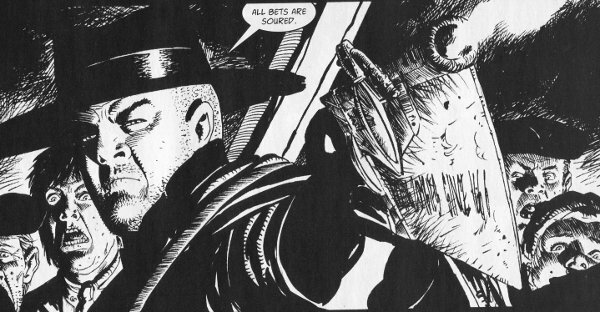 And Defoe, by Pat Mills and Leigh Gallagher, nearing the end of his second ten-part adventure, sees his subplots twist and tangle and get incredibly convoluted in the best possible way. The series does seem to have about twice as many characters as is necessary, but it's really fun. (Tharg! If you're reading, the week before this series returns for story five in 2013, please program a five page "who's who" prologue, would you? Thanks!) I really like the structure, where Titus Defoe is usually deep in the trenches, fighting zombie "reeks" at the street level, completely unaware of all the political machinations going on between Scotland Yard and various palaces and country houses. The story brings him, briefly, in opposition to a lady of the Prussian court, a diplomat who appears to be slumming and enjoying an illegal pit fight between a brawler and a reek, before she takes her leave of the event. He's then contacted by the secret agent brother of the reporter who accompanied him in the first story, who reveals the reporter's tale about his meeting with the villains controlling the reeks, known as Mene Tekel and La Voisin, alias "Mr. Quick" and "Prussian Blue." Defoe realizes that the woman he met is certainly La Voisin, and this story ends with Defoe and Damned Jones preparing to track her down. I really do enjoy this series despite the genuine reality that there are a heck of a lot more characters than anybody can keep up with. Wikipedia is some help, although it reveals the deaths of three of Defoe's twelve (twelve!!!) fellow zombie fighters in stories three and four. On the other hand, ten times as many things happen in sixty pages of Defoe than in sixty pages of anything else in print, so you can't complain too much. Also, the reporter and the spy? Their names are Fear-the-Lord Jones and If-Christ-Had-Not-Died-For-Thee-Thou-Wouldst-Be-Damned Jones. How could anybody not love this comic? Next time, don't get your knickers in a twist, Tank Girl is here! If you enjoy Thrillpowered Thursday, I'd really appreciate your help in spreading the word along. Perhaps the blog is getting stale, or my writing has become predictable, or we've hit the "familiarity breeds contempt" wall, or something, but readership has been noticeably dwindling over the last six months. I should probably redesign this ugly and old-fashioned thing, were the time available, that's for sure. In the meantime, if you like the blog, please tell your friends. I really would appreciate it. Thank you! I've been a long time lurker around these parts and I'll be sure to spread the word (Credo!). Regarding the readership drop off it might be a consequence of the blog's infrequent nature lately; hopefully it's only a blip. That D'Israeli cover is brilliant. 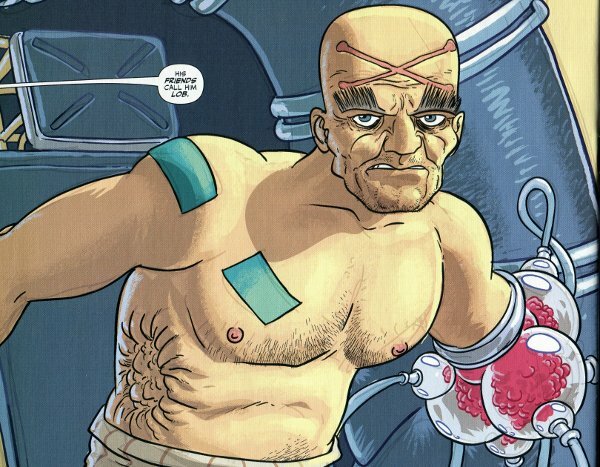 The current series of Low Life has made me a firm fan of Brooker's style, and now you tell me I need to seek out Lobster Random as well as Leviathan. Thanks for finding new ways for me to spend all that money that was just taking up space in my account, Grant. AFork, you've got a good point. If I had the time to devote to 52 weeks of scanning and posting... well, I'd probably find some way to procrastinate anyway. Still, after the next break, I'll make sure to keep punching it for eleven weeks, to the magic number 200 chapters. Sauchieboy, Leviathan is one of the best things ever. Separating Earthlets from their groats in the name of Tharg is one of my favorite things to do!